Frankly speaking, anyone who wants to communicate with another person can do so at almost any time. Whether it is by texting to a smartphone or making contact through social media, communication is so much easier than it used to be, and as a result communication is much more frequent. But there are people who do not communicate themselves, and are not particularly interested in receiving unwanted communication. They shun social media, and perhaps there are those who do not even own a cellphone. When those people are your clients, the lack of communication can be problematic. With those types of investors, advisors are advised to make communication happen. To be clear, there are investors who feel their portfolios are set and they don’t feel the need to communicate. They have made their investment decisions and are willing to live with them as they are. They have no questions to ask, don’t have any changes required in their accounts, and thus require no communication with their advisor. However, advisors must remind themselves that some quiet clients might be unaware of current financial events that could affect their client’s portfolio. Advisors can provide information that can increase the return on investment for an unaware investor and should consider placing a call to those reluctant communicators on their client list. Advisors with an enthusiastic client base may forget there are investors who don’t demand constant attention. But, according to Spectrem’s quarterly wealth segmentation series study Using Social Media and Mobile Technology in Financial Decisions, there are many investors who eschew modern communication technologies, just as there are those investors who don’t pester their advisor on a regular basis. Among Millionaires with a net worth between $1 million and $5 million not including primary residence, 32 percent never call their advisor, and 33 percent never email their advisor. 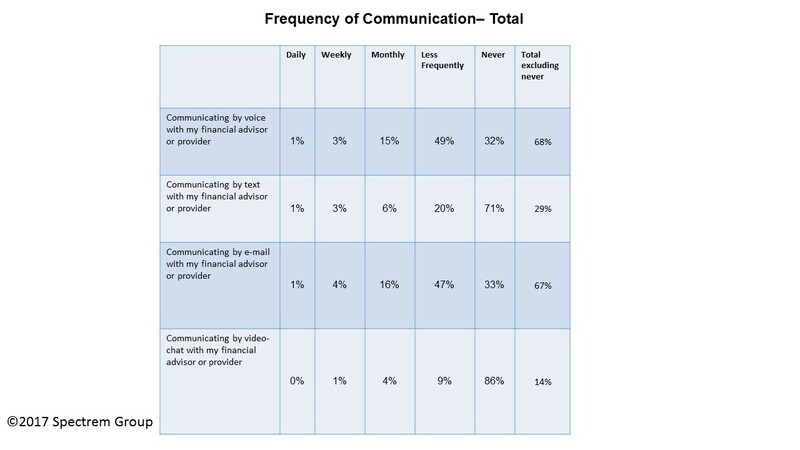 That’s one-third of Millionaires who don’t use the basic communication tools available today to communicate with their advisor. Among wealthier investors, emailing is more prevalent. Only 21 percent of Ultra High Net Worth investors, those with a net worth between $5 million and $25 million, never email their advisor, while 22 percent never call their advisor. (On the other hand, 19 percent of Millionaires communicate by phone with their advisor at least monthly, and 21 percent communicate by email at least once every 30 days). Advisors need to consider noting those investors who do not make regular contact, and reach out to them on a regular, if infrequent, schedule, just to make sure their needs are met and they are aware of all current financial news that might affect their investments. Thanks to the 21st century burst of social media platforms, providers and advisors are urged to implement or increase their posts and communications via social media to reach current and potential clients. Some investors enjoy reading blog posts or articles provided by advisors to keep themselves aware of current financial events. But that does not include all of the investor’s on an advisor’s client list. According to the Spectrem report, 30 percent of Millionaires do not use any of the most popular social media websites. An advisor’s informative Facebook post about changes in social security regulations, for instance, will not reach those investors who don’t ever access Facebook. When meeting a new client, advisors should ensure clients feel free to make contact whenever they want, using whatever method they prefer, and should come to an agreement with clients on the frequency and method they prefer to receive communication from you. Then exceed the frequency. Spectrem research reflects that client satisfaction increases when advisors communicate more than their clients expect.